The men’s and women’s cross country teams totaled for five runners in the top 20 at the State University of New York Athletic Conference (SUNYAC) Championship meet Saturday, finishing third and fourth on the women’s and men’s side, respectively. While SUNY Geneseo totaled for 16 runners between the two races within the top 15 to place first, SUNY Oneonta and The College at Brockport were the only teams to beat New Paltz on the men’s side, while SUNY Cortland beat the Hawks by a hair on the women’s side. Entering the day without one of its top three runners due to a leg injury, third-year Vanessa Morgan, the women’s side came six points shy of placing second to set a program record. Third-year Emily Cavanaugh led her team with a sixth overall finish, clocking in at 24 minutes, 39.1 seconds, becoming the first runner to cross that wasn’t on Geneseo’s team. Second-year Cassandra Williams placed 11th overall with a time of 25:28.9, while first-year Clara Flores-Reininger was the first freshman out of all the teams on the women’s side to cross the finish line, placing 17th at 26:19.1. First-year Mary Breckenridge finished 39th, while third-year Julia Eddy finished 40th, to round out New Paltz’s top five. Much like the women’s side, the Hawks men’s team was filled with injuries and illness coming into the weekend. However, they beat their 2017 performance, moving up from eighth to fourth overall this year, and defeating SUNY Cortland for the first time in coach Trunkes’ time as a Hawk to have their best showing in SUNYACS since 2002. 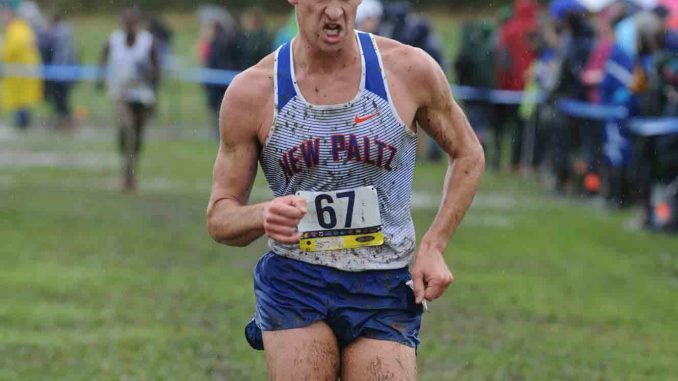 Fourth-year Barrett Celecki led New Paltz with a 14th place finish, clocking in at 29:45.3. Third-year Jack Wilson also ran well, finishing just behind Celecki in 16th at 30:02.3, while third-year Matt Whitworth finished 27th at 20:49.8, first-year Conor Van Riper finished 28th at 30:57.9 and fourth-year Stephen Smith finished 31st at 31:18.5 to round out the Hawks top-five. Following the race, Celecki was named Third-Team All-Conference on the men’s side. On the women’s team, Cavanagh earned herself a spot in the SUNYAC Hall of Fame, following her sixth-place standing and illustrious year. She was also named Second-Team All-Conference, while Williams earned a Third-Team All-Conference selection to go along with her Elite 20 Award, given to the top athletes in each sport who are in high academic standing. New Paltz will now wait to see who qualified for the NCAA regional meet, held in Glassboro, New Jersey on Nov. 10.